If there’s any lesson from our recent recession, it’s that copious spending can be the quickest way to beating down the door of bankruptcy. These are the recent lessons at least from many an American municipality, as cities and towns all across the country are now facing the plight of the people they serve, spending down their previously well-kept coffers to the brink of a bankruptcy filing and beyond. In fact, just last month, coming in the major footsteps of California cities like Mammoth Lakes and Vallejo, Stockton, California became the biggest U.S. city ever to file for bankruptcy. According to a recent Reuters article, Stockton’s “bust,” followed years of booming conditions, a familiar cycle predicated on a strong stock market that bolstered pension funds and an unrivaled increase in real estate values that brought in a ton of tax revenue, all of which gave the city a false sense that wage hikes and extended health insurance for retirees was the way to go to retain the municipality’s then-valuable 1990s workforce. But fast forward to the next decade, and as Reuters reporter Jim Christie illustrates, spending turned to fiscal mismanagement as revenue risks overcame Stockton’s actual financial rewards. Enter the housing crisis of the late 2000s, plummeting home prices, and a general state of fiscal shock for many California localities, and Stockton, like so many of our nation’s debtors, couldn’t stand a chance. But before you think a bankruptcy filing can hurt you too, there are plenty of lessons for individuals to learn from the Stockton situation, including valuable lessons in spending within your means before, during and after your bankruptcy. If spending sprees got you into credit trouble like they did for Stockton, remember it’s never too late to track your spending, including income and expenses, to dig yourself out. Budgeting better gives you better knowledge of where your money is going and peace of mind as you start the process to stop living paycheck to paycheck. Learn that if you can’t pay in cash, you can’t afford it. Breaking a dependency on loans and/or credit can be the key to deciphering what you “need,” versus what you simply “want.” This is a valuable lesson not only for those who seek to avoid insolvency, but also for those seeking to forestall a second bankruptcy. Once you’ve assessed your income as well as your spending, you may come to the conclusion that that you don’t have enough money to cover your many monthly expenses, much less save for a rainy day. At that point, you may want to consider bankruptcy. A bankruptcy filing can discharge debt and allow you to save for your next financial steps, including your home, your child’s college fund and even retirement. 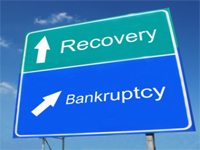 If you’re in your own Stockton-style situation and interested in the process of securing a better financial future in North Carolina through the safe havens of bankruptcy, remember that contacting an experienced bankruptcy attorney can help you face even your worst financial fears. In particular, the bankruptcy professionals at the Law Offices of John T. Orcutt offer a totally FREE debt consultation and now, more than ever, it’s time to “Stock-up” on their advice.